Turbos provide enhanced fuel economy and performance. A turbo is a basic "air pump" that pushes a volume of air into the engine, which increases the power output. This turbo "air pump" is driven by a fan located in the exhaust by a direct shaft. The more exhaust that flows, the more air is pumped into the engine. In most automotive and some other applications, a wastegate is provided which opens as pressure is increased by the "air pump". This device prevents an overboost from damaging the engine. As air is pumped and compressed into the engine by the turbo, it rises in temperature. To reduce this problem and make the turbo more efficient, vehicle manufacturers have been adding intercoolers. An intercooler is a radiator for air and is usually located in front of, or behind the main radiator itself. To add to the life of the turbo unit, some turbos are also water-cooled by coolant system connections. This feature limits the operating temperature of the turbo to the temperature of the cooling system, thus, protecting the bearing assemble from excessive exhaust temperature. Turbo units may obtain speeds up to 100,000 RPMs, depending on the application, so it is extremely important that a sufficient supply of clean oil always be entering the turbo while the engine is running. If for any reason, whenever the oil supply is interrupted or becomes contaminated, "good-bye turbo". Turbo failures are mostly caused by lack of lubrication or abrasive material in the oil. Other failures occur when heavy particles enter the air stream on the suction side. Therefore, a clean air filter and ducting is necessary. Another type of failure may be caused by objects from within the engine leaving via the exhaust. This could be hard carbon, broken engine parts, manifold rust, etc. Change the oil at least every 3,000 miles, or more frequently if you wish. Always use the oil that is recommended by the engine manufacturer. Do not use cleaning additives for it may loosen particles in any used engine. Always let the engine warm up when starting. 30-60 seconds in warmer weather and longer as the temperature drops. COLD, THICK OIL DOES NOT FLOW AS FREELY AS WARM OIL! Do not rev engine during warm up time, the turbo may not yet have received a full supply of oil. Always let the engine idle for a period when stopping. The faster you have driven, the longer you should let it idle down. YOUR TURBO IS FREE SPINNING AT HIGH RPMS WHEN THE ENGINE IS SHUT OFF THE OIL SUPPLY IS ALSO SHUT OFF, WHICH MAY RESULT IN BEARING DAMAGE ALMOST IMMEDIATELY. When oil is changed, always prime the filter and crank over engine without starting until oil pressure is observed. By following these suggestion, and practicing good driving habits, your turbo should last as long as the engine. The term "turbo" or "turbocharger" is frequently heard in the world of high-performance. However, many people are unfamiliar with these devices and this is unfortunate, because turbocharging is one of the most cost-effective methods of producing maximum horsepower per dollar. The turbo itself is a relatively simple device. Its moving parts basically consist of two wheels mounted on a common shaft; the turbine wheel and compressor wheel. The shaft is mounted in oil-fed bearings inside a compact center housing and the wheels are located at either end of the shaft, each one in its own housing. In function, exhaust gases leaving the engine are directed into the turbine housing. This housing directs. the high-velocity gases at the turbine wheel, causing the wheel to rotate. After the gases have passed through the turbine wheel, they exit the turbine housing and are discharged through the vehicle's exhaust system. 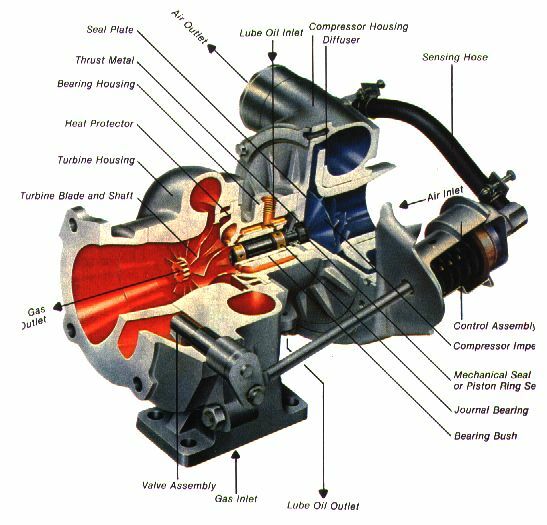 The rotation of the turbine wheel drives the compressor wheel (which is at the opposite end of the shaft). As the compressor wheel spins, it inducts air into the compressor housing. There it is compressed and discharged into the intake system of the engine, providing boost pressure. A turbocharger creates horsepower by forcing more air into an engine than that engine could normally ingest during the intake portion of its cycle. It does this by compressing air then forcing it into the intake manifold and ports. This additional pressure is known as boost pressure. Boost pressure is typically expressed in pounds per square inch or millimeters of Mercury. This gives us an indication of how much additional airflow and pressure there is available to the engine when the turbo is operating. The amount of boost pressure is usually determined by a wastegate. This device is frequently an integral part of the turbine housing. It functions by passing exhaust gases around the turbine wheel so that the amount of exhaust driving the turbine is limited. In this way, by opening the wastegate at a preset boost level, we can control the speed of the turbine wheel (which is driving the compressor) to maintain that boost pressure without overboosting or providing the engine with too much airflow and pressure. Many people are confused about the differences between a super charger and turbocharger. Booth families of devices are basically air compressors, but they're operated' quite differently from each other. A supercharger is mechanically driven by the engine itself; usually off the crankshaft by a cogged belt and pulley system. This means that a supercharger uses up some of the engine's horsepower just to drive itself - often 60 horsepower or more! Fortunately, the airflow generated by the supercharger helps it produce far more horsepower than it requires to operate. A turbocharger, however, is driven by the thermal energy of the exhaust gases of the engine. With non-turbocharged vehicles, these gases are simply discharged out of the engine as quickly and efficiently as possible, wasting a surprising amount of energy in the form of noise and heat. A turbocharger uses some of that energy (which would otherwise be wasted) to drive its compressor, without the attendant horsepower loss of a crankdriven system. The result? The turbocharged engine stands to produce more peak horsepower than a comparable supercharged engine, mostly because the turbo does not require any power from the crankshaft. Also, the turbocharged engine will typically run much quieter than a supercharged engine since the turbo has no gears, belts or pulleys and because the turbo itself muffles the exhaust. And while many superchargers are large, heavy devices (we've all seen Roots-type blowers sticking up through the hoods of muscle cars), the turbocharger is a relatively small package - a turbo capable of producing 600 horsepower can weigh only 15 pounds and be easily held in one hand. It is for these reasons that turbocharging has become increasingly popular with both OE and aftermarket manufacturers. Automakers can produce lightweight vehicles with good fuel economy yet excellent power thanks to the turbo. The aftermarket manufacturers have jumped into the game, offering larger turbocharger "upgrades" in place of factory turbos, or even complete turbo "kits" to convert a naturally-aspirated vehicle to turbocharged configuration. One question we hear quite often at SCC is whether a normally-aspirated engine can be turbocharged. Any engine can be turbocharged, and there are a number of turbo kits available to allow you to do this to a variety of vehicles. However, if you cannot locate a kit for your vehicle (or you choose not to purchase an existing kit), you can build a custom installation yourself. * Exhaust must be routed to the turbine inlet of the turbocharger. This is typically done with a turbo exhaust manifold, when available, or a custom adapter plate to allow you to mount the turbo to the factory exhaust manifold. discharge side of the turbo to the exhaust system. discharge to the intake manifold. This is typically done in aluminum or steel tubing which is then coupled at all joints by silicone hose couplings or nitrile rubber connectors. Flex hose is sometimes used on the inlet side of the compressor since it is only subjected to vacuum, not pressure. *Pressurized oil must be fed to the turbocharger's bearings. The most common place to tap into an oil galley is at the oil pressure sending unit. choosing the proper turbocharger for your car. There are a variety of kinds of boost controls on the market. Some control air flow in and out of the compressor (such as pop-off valves or restrictors), but the most efficient (and for this reason the most popular) are controllers that work on the turbine side, which are known as wastegates. As mentioned earlier in the article, the turbine wheel is driven by exhaust gases. A wastegate functions by taking a portion of the exhaust gas that would drive the turbine wheel and rerouting to bypass the turbine wheel. This way we can control the speed of the turbocharger and therefore, limit the boost the turbo produces. A boost control should be used so that you can limit the total amount of boost to the engine to prevent detonation. There are other details to contend with, such as fuel enrichments, ignition controls, where and why to install check valves in vacuum lines, and so on. Therefore, it will be very helpful to both you and those helping you if you do your homework ahead of time. There are several useful books written specifically on the subject of turbocharging, some of which are available from bookstores. Is turbocharging safe for my engine? There are several factors to take into account when turbocharging a vehicle. First, if the engine has high mileage and/or a good deal of wear, your money may be better spent freshening up the rings, bearings, valve guides, etc. before you invest in a turbo system. The additional stress put on the engine's internal components by the increase in horsepower may cause a weak engine to expire! Furthermore, you -should determine whether, the engine's compression ratio permits the addition of a turbo. Since we're already compressing the charge air with the turbo, the higher the engine's static compression ratio is, the greater the tendency toward detonation. In other words, the higher your compression, the less boost you can run. In our opinion, when properly installed a turbocharger system is capable of producing the best bang for the buck. When factoring in its reasonable cost, relatively compact size and adaptability to any sport compact car, turbocharging makes a whole lot of sense for the enthusiast seeking big time horsepower gains! For those that can't get enough of turbo-related goodies, check out the Turbo Club Of America. A one-year membership entitles you to club discounts on performance equipment from participating manufacturers and six issues of Turbo Club News plus much more! Author Chris Weisberg is a Turbocharger Specialist for Turbonetics, Inc., manufacturers of custom turbochargers and controls. Garrett basically has two lines of turbos. The ancient, inefficient T series turbos and the new, ball bearing GT series turbos. The newer line of GT turbos are ball bearing on journal and thrust bearing. The turbine and compressor wheels are improvely aerodynamically to flow more air. GT20, GT22, GT25, GT30, GT35, GT40, GT45, GT50... GT turbos produce slightly more hp then older T series turbos with the same number designation. HKS uses Garrett turbos. HKS GT series turbos use Garrett GT's turbine with GT's compressor. For example, HKS GT 2835 is GT28 turbine with GT35 52 trim compressor. The newer line of Garrett GT-R turbos are hybrid turbos. For example, GT30R is a hybrid of GT30 turbine mated to 56 trim GT37 compressor.